A superb vintage and experience-informed three single-coil bolt-on. Build, playability, sound and typical PRS attention to detail and quality. Limited colours, no options or lefties and very derivative. Not all will get the frets, headstock or vintage fingerboard radius. Oh dear, oh dear. What on earth has happened here? Over the past couple of years there has been endless speculation on what the first unlimited collaboration between Paul Reed Smith and John Mayer would bring. Mayer has been posting videos of what appeared to be a Stratocaster with the ‘wrong’ headstock, while PRS has steadfastly refused to comment. Well, the wait is over and the guitar is here, officially the PRS Silver Sky John Mayer Signature. But to the rest of the world, it’s a Stratocaster with the ‘wrong’ headstock, isn’t it? Now, PRS certainly isn’t the only maker to appropriate Fender’s finest moment: numerous makers adhere to the recipe, some more closely than others. PRS is rather late to this party although it has used some of that recipe on numerous occasions, culminating most recently in the 305 and the DC3 - both relatively short-lived. But the Silver Sky is different: visually, sonically, even in feel and hardware choice, it’s unquestionably the most Strat-like guitar to ever be produced at PRS’s Maryland factory. 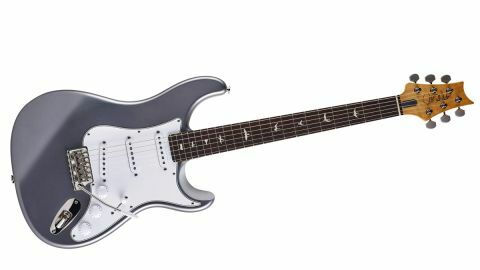 Most modern makers - aside from copyists and fakers - that use the Stratocaster as a start-point subtly alter the guitar’s classic outline, and the Silver Sky is no different. Starting off where the PRS DC3 left off, the primary change lies in the treble cutaway which isn’t as deep although that’s compensated for by PRS’s trademarked scoop. The bass-side cutaway reaches into the body a little more too and the tip of the heel has a curved nose although no contouring like many choose to add. While PRS’s original bolt-ons used exactly the same neck design as the glued-neck models (with its own heel and an extension that sits under the neck pickup), like the DC3 this is a Fender-style, held to the body with four machine screws through a black-plated metal neckplate bearing the model name and artist signature. Body wood is alder (spec’d as two or three-piece although under the opaque finish it’s impossible to tell) and we get the expected contours and big edge radius. Speaking of finish, while much of the guitar references the Stratocaster circa 1963-4, the finish doesn’t. Yes, the slab-sawn, spliced-head maple neck has a lightly toned gloss nitrocellulose finish, but the body uses a polyester base coat with acrylic urethane top coat. “We have switched formulas several times in the finish hall - always in search of the best,” we’re told. “V12 was our original term for crystalline acrylic urethane. We stopped using the term years ago [er, it’s still on your website]. But, the essence of the finish is the same - just the formula continually changes.” Purposely, however, there’s no finish inside the pickup routes so that “the wood can breathe over time,” says PRS. PRS might be known for its 635mm (25-inch) scale length that sits between Fender and Gibson standard but here, of course, we’re chasing the Stratocaster so, like the 305 and a couple of SEs, it’s the correct 648mm (25.5 inches). Similar to the scale, PRS primarily uses a 254mm (10-inch) fingerboard radius - flatter than original Fender, rounder than traditional Gibson. Not here. Like the scale, the radius reverts to vintage Fender: 184mm (7.5 inches), and the small frets which are marginally taller than vintage Fender spec. in tracks to stop any sideways movement. Pivots on the Gen III screws are slightly chunkier with a more ‘V’d notch compared to the previous screws. The stainless steel arm still push-fits (with tension adjustment) but sits slightly higher as it emerges from the block, has more of a right angle bend and is shorter in length by about half the length of its plastic tip. This retooling is everywhere: whereas Fender classically use a pressed metal jack plate, PRS use the same concept but it’s cast zinc and nickel-plated with a lightly cambered top. It’s a lovely piece but again, visually, oh-so Fender. Likewise, the control knobs sort of mix a Fender knob with PRS’s more fluted ‘lampshade’ design; the five-way lever’s white cap is more like we’ve seen on PRS switches than the classic round cap of Fender’s style. Obviously, the bright white/ black/white plastic scratchplate is altered but again still shouts Stratocaster, and the standard-sized pickups are loaded into quite rounded edged (almost vintage worn) plastic covers with protruding magnet poles and a modern stagger: the lowest poles are the E strings, the A and the B poles sit in the middle and the tallest are the G and B poles. Even the good ol’ bird inlays have been downsized here. The pickups themselves all boast the same output with a DC resistance, measured at the output, of approximately 6.27kohms. Controls follow Strat protocol, master volume with two tones: tone one works on neck and middle and tone two affects the bridge pickup - a well-used adaptation of vintage style. But the elephant in the room is, of course, the very un-Fender-like headstock: essentially a reversed ‘left-handed’ PRS outline with the treble side pulled forward approximately 15mm. It’s lightly back- angled too which avoids the use of any string trees and provides a pretty even rake from the bone nut to the tuners, unlike a typical Fender. Sensibly, we also have the truss rod adjustment behind the nut. but far from over square. And any worries that the small radius will choke out are completely unfounded; thumb around or thumb behind it’s extremely comfortable. Action is pretty normal, a shade over 1.5mm on the treble side and a shade under 2mm on the bass measured at the 12th fret with minimal relief (approx. 0.127mm) and a saddle radius that’s closer to 229mm (nine inches). Yes, the smaller frets might take more adjustment, as the lower height means your fingertips feel more contact with the rosewood ’board than they do with a bigger jumbo wire. They seem to contribute to a slightly different note attack, a little snappier, woodier perhaps? Yet the sustain is noticeably rich - the headstock and body feel alive and vibrant. Plugged in there are some gorgeous sounds: neck, neck and middle, middle and bridge all hit the spot immediately. The neck’s voice balances a fullness in the lower end with cut but not too much metallic percussion; those textured combined voices don’t sound overly scooped (and are hum-cancelling). After our first play test we realised we hadn’t gone to the middle or bridge but in our second session neither disappointed. The bridge is rather like the PRS 58/15 LT, it’s not quite what you expect: it isn’t wig-lifting and its ‘honk’ is pulled back a little. Kick in some dirt and roll back the excellently tapered tone and the Strat’s textured, grainy rock voice comes to the fore: the middle pickup offering a darker, subtly deeper but nicely gritty texture. Yes, it’s a Stratocaster but there’s a really noticeable balance between heft and spike, a huge dynamic range and that wonderfully enveloping sustain. This is a guitar that we really don’t want to put down. On the one hand every sound recalls a great Strat player, or style, but everything works so well that once you get over that you’re into your own sonic space. A good Strat is exceptionally versatile. This is like a good Strat. But then we all have good Stratocasters, don’t we? Listening to what we have to hand, from our favourite bitsers through to well-gigged Fenders and a loaned Suhr Classic Antique, we’re reminded just how different Strats can sound - essentially the same but darker, brighter, woodier, snappier, etc. And your taste might be very different from ours. You might want more kick from the bridge or a little more cut. But let’s just remember this guitar, based on his own vintage Stratocasters, is voiced to suit John Mayer. Apparently it does and we can only add that, sonically, it’s one of the best Strat-style voices we’ve played. By design the vibrato sits flat on the body with no upbend and a relatively stiff feel with more than enough down bend for most classic styles. Tuning stability wasn’t spot-on: after some vigorous down bends (that would, or should, get you sacked from any band) the D string was coming back sharp, caused by a slight burr on the top plate where the string emerges from the block. A little TLC here and a lot of string stretching and we’re fine but we’re reminded that this is a vintage spec bolt-on: there are noticeable marks to the saddle tops already - something to look out for, and potentially maintain. The string spacing, by the way, sits between Fender vintage standard and PRS’s usual spacing. This is a hugely engaging take on Fender’s iconic Stratocaster. Led by detail freaks Paul Reed Smith and John Mayer, would we expect anything else? Yes, the design is derivative but PRS aren’t alone in producing their own version of Fender’s finest dish and there’s vintage reference here that’s often absent from modernised designs, not least its fingerboard radius and frets. While that radius, the slightly uncomfortable-for-many adaptation of the headstock not to mention the, albeit down-sized, bird inlays might well have Marmite appeal, in the hand it simply feels extremely ‘right’, backed up with a sound that’s easily the most Strat-like of any previous PRS designs that have aimed in this direction. For the PRS devotee, it’s a no brainer - a different and hugely classic tonal colour to add to your sonic palette. The appeal to John Mayer fans is obvious. Outside of those aficionados, well, there is plenty of choice in the quality bolt-on market around this price - many offering plenty of options in terms of specification and finish. Here, the four opaque colours aside, what-you-see-is-what-you-get: this is a signature guitar, not a standard model. PRS will not pass comment on what the future holds but in the same way as anyone can see this guitar’s reference, it doesn’t take a business analyst to guess after all this detailed and costly ‘retooling’, the company will - in its own time - offer the market a more standard model with, hopefully, more classic colours and, not least, a maple fingerboard option. As is, aside from being one of the most hyped and discussed new electric guitars this writer can remember, the Silver Sky remains a highly-tuned signature, a vintage-informed Strat-alike in pristine contemporary dress. Of course, as the trillions of words that are clogging internet forums as we write proves, not everyone ‘gets’ PRS, or indeed John Mayer. And while we’re huge fans of both, and indeed this guitar, it’s disappointing that its hugely positive attributes - build, feel, playability and sound - couldn’t have been presented in a more original, not to mention PRS-like style.